Off-shore wind has shown proven economic viability around the world. 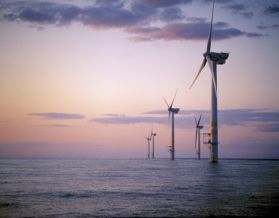 Off-shore wind farms are present off the shores of numerous countries including Denmark, the United Kingdom and most recently off the east coast of Ireland. The Arklow bank project (Phase 1) is a 25 MW partnership venture between Airtricity and GE Energy. While off-shore development has many advantages over its on-shore equivalent, higher capital costs and high site dependency represent some of the challenges to development, although it should be remembered that higher generation yields do go a considerable way towards offsetting these initial capital costs. For more information, please view our off-shore Frequently Asked Questions section.